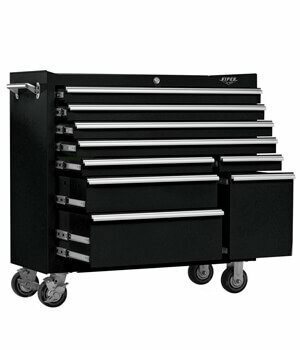 Tool cabinets are designed for storing work supplies and tools. 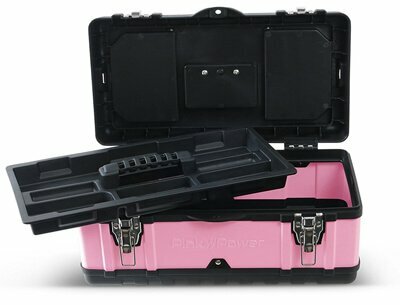 They make it easy for you to organize and keep your tools protected. 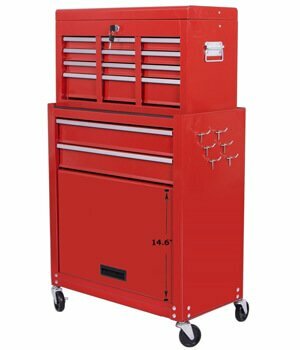 Additionally, these cabinets make it easy to transport the tools to place of work conveniently. When selecting the best tool cabinets ensure that you go for the model that features a durable and rugged construction, as it will withstand repeated use without any problem. They are usually meant to be stationary, hand carried or sometimes rolling. This guide will help you to understand the different types available and give you some tips to help you select the best. These tool cabinets are often too large to be moved around. 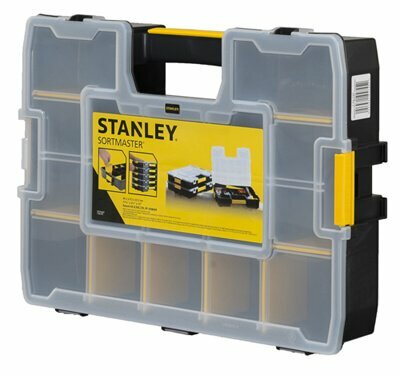 They come with multiple of compartments that will hold a wide variety of both small and large tools. This type of a cabinet may also have tools on the bottom to make it movable around your house. 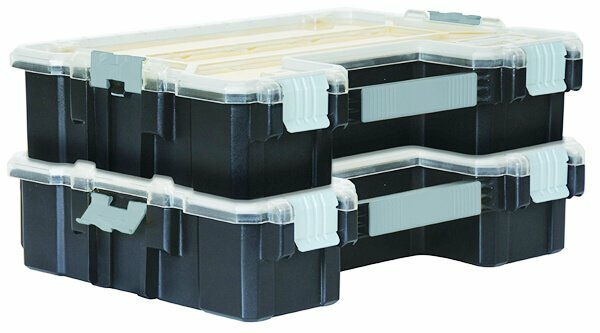 These are perfect for storing tools in your garages and workshops. If you are looking for a model for transporting your tools to a job site, these are the best choice. These products will help you to transport your tools anywhere you want them to. Generally, these cabinets have multiple boxes stacked together on a rolling case that has a handle to make it easy to move around. These cabinets usually have wheels at the bottom to make it easy to roll on the ground. If you do not have a lot of tools and still you would want a nice tool to keep all your tools, then this is a great choice. This is one of the widely used tool cabinets you will find with most homeowners, as it is easy to carry around the home and around the yard. Since they are small, they will not take much of space in your house making them great for individuals with limited space. 60" x 30" x 57"
This is a great choice for individuals who are looking for a nice tool cabinet but do not want to spend a fortune. This cabinet is constructed using high-end materials to ensure that it last for long. It is very spacious to ensure that all your tools have enough space. 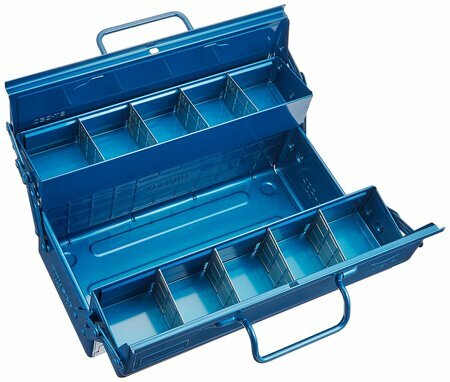 It comes with one top drawer, which is long to keep tools that you regularly use, two trays, and three small drawers for keeping smaller tools and a big cabinet at the bottom for storing larger tools. To ensure that your tools remain in top condition, the drawers, as well as the trays, have a foam material that keeps the tools in place. To make the cabinet easy to transport, it comes with side handles on both sides and four wheels at the base. To keep your tools secure each cabinet and drawer come with a set of two keys each. This is a heavy-duty model best suited for professionals who are looking for a heavy-duty rolling cabinet that can withstand repeated use. This cabinet comes with six drawers that give you more than enough space to store all you need to carry to your job site. 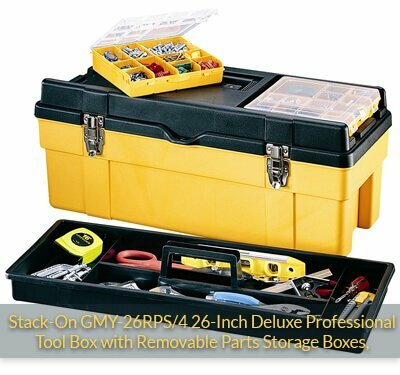 To ensure that all your tools are safe and protected from scratching each other the model comes with drawer liners as well as a top mat. Another impressive feature that comes with this product is the caster swivels wheels with wheel breaks. This means that you do not have to worry when moving down the wheel. In addition, an ergonomic handle makes pulling the cabinet rather easy. You are provided with two keys to lock all your tools securely. Most individuals who have already purchased the product also love the stylish design that makes it stand out. 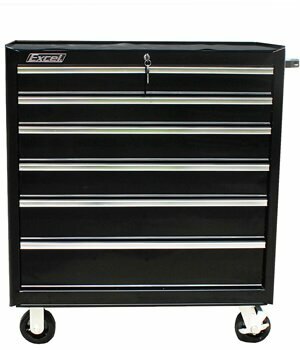 You will definitely love this high-end tool cabinet that is constructed using 18 steel gauges to make it durable. The sturdy construction also makes sure that your tools get the needed protection to make them last for long. The four drawers have the capacity of holding up to 100lb load, thus giving you a chance to load the heaviest tools you may have. 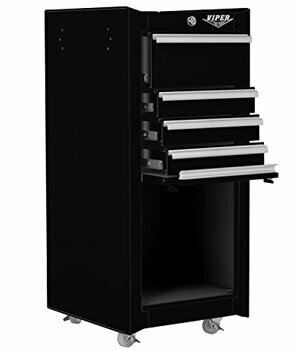 You can use this tool cabinet in the harshest working conditions without worrying as it comes with powder coated finish that will stand up to scratches, dings, and chemicals. 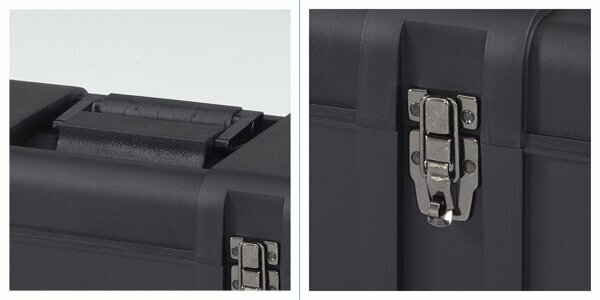 Another great feature is the internal locking bar as well as the tubular cam lock that will keep all your tools secure conveniently with only one key. 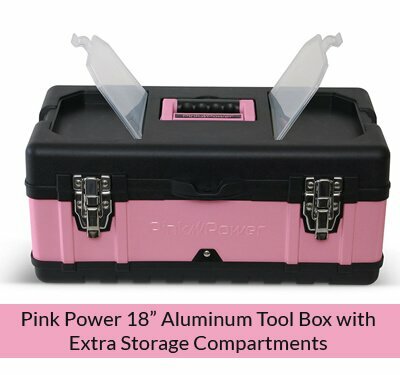 The model also features oversized compartment where you can store the large sized tools. If you are looking for a model that offers you additional storage space, you should then consider going for Excel TB2608X-Black 36-Inch Roller. This model comes with six drawers, which are very spacious. Unlike other cabinets that are difficult to open especially when loaded with heavy tools, this model comes with seven ball bearing slide drawers and full-length aluminum drawers which are super easy to open. This model is constructed using cold rolled steel making it a durable cabinet that withstands repeated usage without any problem. The cabinet also has a powder coat paint that makes it resistant to corrosion and scratches. The heavy duty swivel wheels that require no maintenance makes it easy to move to the job site. Additionally, the product features an ergonomic handle that provides you with a firm grip. 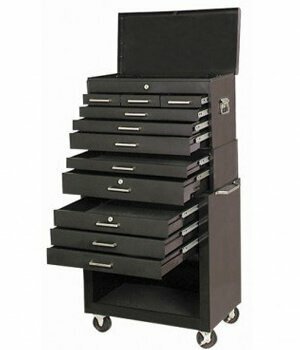 As the name suggest, this tool cabinet comes with 11 cabinets that come with different sizes. 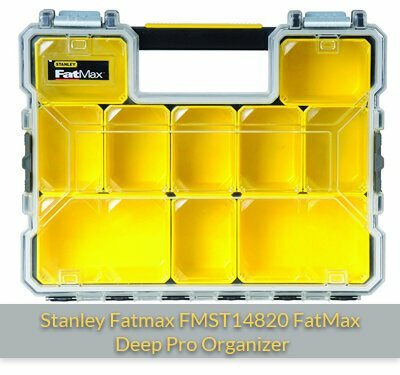 This makes it easier for you to organize your tools according to the size. You can store the smaller tools such as screwdrivers, nuts, and screws among others on the smaller drawers and use the large sized drawers to store other larger tools such as table saws, miter saws, and drills. The drawers have a capacity of 350lbs, which is impressive especially if you combine with the 286lbs capacity on the top. All the drawers are lockable to ensure that all your tools are secure. To make the cabinet portable, it features swivel wheels that are sturdy and maintenance free. The wheels are also fitted with breaks to make moving downhill simpler. The rugged design makes it durable while its black finish, which is powder, coated makes it rust and scratch resistant. The unique design that comes with this model makes it perfect for both DYIers and professionals alike. The product is also reasonably priced, making it an ideal model for individuals who are on a tight budget but would still want to provide their tools with the best protection possible. 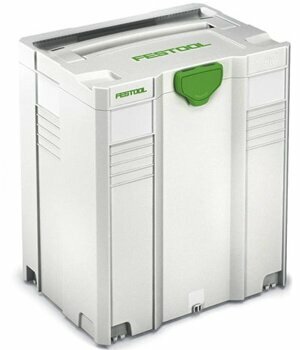 To make it easy to transport, it will connect with other systainers as well as a Festool CT dust extractors. Many users love this product, as it is easy to stack and latch all the tools together with the related accessories to create job-specific kits that are highly mobile. Other impressive features that make this product one of the best tool cabinet is the sturdy construction that makes the product durable. Additionally, all the systainers come with a footprint that is identical, which makes it easy for you to stack them and transport. This is another high-quality product from Viper Tool, which is one of the best manufacturers when it comes to tool cabinets. 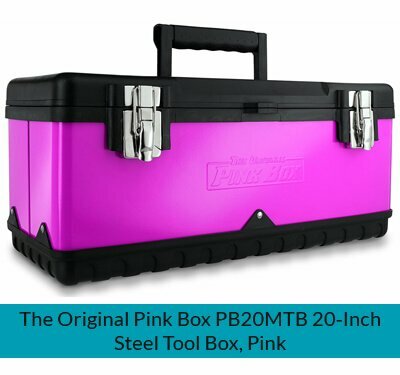 One of the features that make it stand out is the 18 gauge steel construction that makes it one of the toughest tool cabinets available on the market. The model also features high capacity drawers with each of the nine drawers holding up to 100lbs. To protect it from scratching and rusting, the cabinet is fully powder coated. The cam lock will allow you to lock all the drawers using one key, which is impressive, as you do not need to have a single key for each drawer. The clients who have already purchased the model have also given a lot of positive feedback about the durability and ease of use. The product also has a limited life warranty. 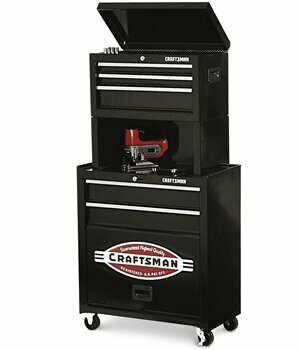 This is a great solution to individuals who are looking for a great tool cabinet to store craftsman’s line of tools. The model comes in a rugged design and is made to take much abuse without falling apart. The 11 drawers are rated at 100 pounds each making them one of the best on the market. To make sure that all your tools are safe and well organized each of the drawers has precut drawer lines as well as full-length drawer trim to make them easy to pull. This model is also reinforced with aluminum corner trims that make it sturdier. Locking the drawers is simple as the storage unit features an innovative locking mechanism that lets you use one key to lock the top drawer and all the other drawers are locked. The shrivel wheels at the bottom also make the model easy to move around. 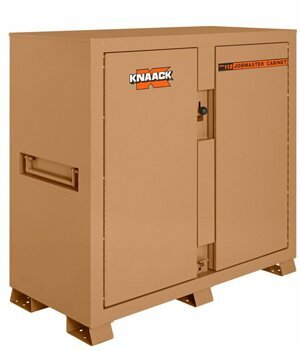 The Knaack 112 is great for someone who needs a tool storage unit that offers the best security. This model comes with the strongest deadbolt locking mechanism making it almost impossible to break in. While the locking mechanism is superb, the owner will find it very easy to open as it features a convenient foot latch that opens easily with one push. The only jobsite storage cabinet offering the strongest deadbolt style locking mechanism for ultimate security. Convenient Foot Latch – One push with your foot and the doors will pop open. The product is also constructed using high products that offer your tools the protection they need as well as securing them from buglers. The drawers will allow you to organize your tools for accessibility. 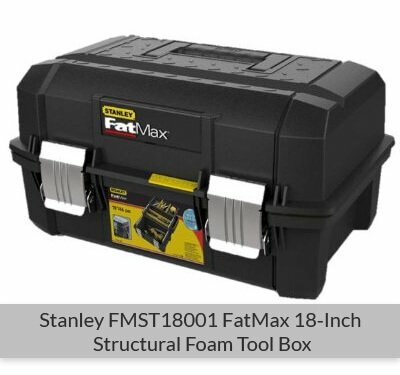 If you are looking for something that is sturdy, durable, easy to use without compromising the safety of your tools, then this is it. Just because you have, a tight budget does not mean that you have to purchase a tool cabinet that will not last for a few months without falling apart. This is one of the best models that give you a service that you can depend on at an affordable price. The product will ensure that your work organized with every tool in its right place, making it easy to access. The ability to stack the tools on top of each other makes it easy for you to add more tools in the future. You can keep your tools in order the easy and versatile way, with a modular tool storage and organization system that grows with your needs. You will also love the sturdy construction that makes it last for many years. Additionally, this product comes with two-inch wheels that make it easy to move around your house or to the job site. It is ideal for people who do not have many tools but plan on adding more in the future. 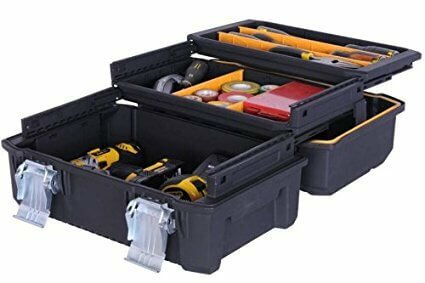 We have come up with this list of the top 10 best tool cabinets after in-depth research and considering customer reviews to ensure that we only bring the most appropriate storage kits that you can never regret picking. To make sure that you pick the tool cabinet that suits your wants perfectly compare the features and select the one that fit your needs. 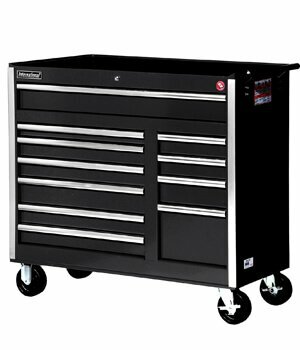 There are many similarities between a tool cabinet and tool chest, and most often people use these words interchangeably when talking about toolboxes. However, there is a slight difference when it comes to the two. The major difference comes to size. Unlike the tool chest, the tool cabinets tend to be more portable. 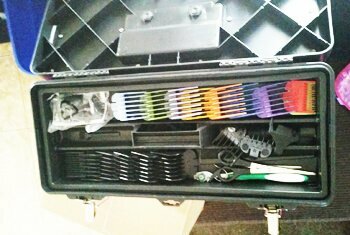 The tool chest comes in large numbers with multiple compartments and drawers that you can store all your tools. 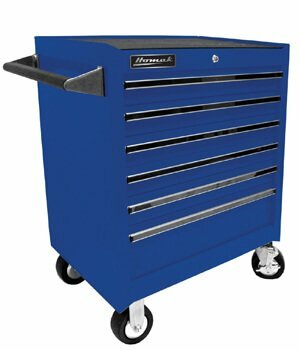 Although some come with wheels, it would be tiring to pull a 200pounds toolbox just to repair your car or a simple renovation project, which you can use, a simple cabinet to carry your tools easily. Although it can seem overwhelming when searching for the best tool cabinet for your home, it does not need to be so. Whether you are a homeowner or a professional contractor, you can get the right tool cabinet that will fit your needs. To help you make the right decision, please follow these tips. Every person storage requirement is different. For instance, a homeowner will need a different cabinet than a professional carpenter. This may be in terms of storage space available, the quality of the cabinet or portability aspect. If you were a professional, you would need something more spacious to hold all your tools and still leave space to add more in case you would want to add a new tool to the collection. On the other hand, a homeowner may require a less spacious tool cabinet as you are likely to have lesser tools that a professional. Another important consideration is to determine whether you need to move the tools to the job site or not. Remember if you have a wide collection of tools and you need to move them to the job site often, getting one big cabinet to store all your tools is not a viable option. 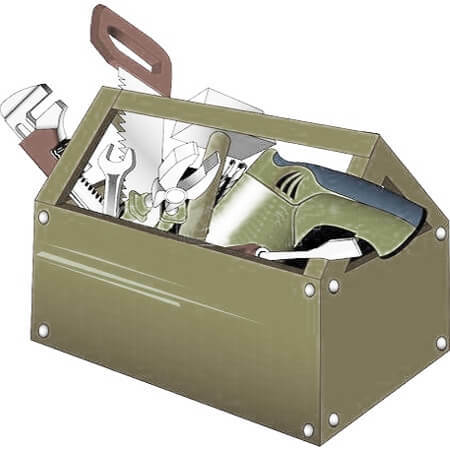 Tools tend to be heavy so storing them in different tool boxes will make them easy to transport to the job site. However, if you are looking for a cabinet to store all your tools in your garage, then getting the biggest model depending on the size you need will be more economical. Although not all people require moving tools outside their homes, you may still need to move them to different areas inside the house. For example, you may want to work on your car, which you have packed on your driveway or at a workbench at the corner of your garage. To save space, you may have decided to purchase one big cabinet to store all the tools. However, getting a big cabinet without wheels will make it difficult to move it around the house. Another consideration is to select a model with well-constructed wheels, which will withstand the weight of your tools without a problem. To ensure that you purchase a tool cabinet that will give you a service that you can depend on for many years to come, ensure you select a cabinet constructed using high-quality materials. Some of the materials used include metal, plastics and sometimes wood. The model constructed with metallic frame tends to be more durable but heavier and more expensive. On the other hand, the model constructed using plastics is less expensive and lighter, but it won’t last like the metallic model especially when carrying heavy tools. The wooden model is a great choice, but you must take extra care to avoid rotting. While purchasing the best tool cabinet you should also consider the weight of the tools, you have. For example, reciprocating saws are usually larger, and some are considerably heavy. If you have, several saws like these, a table saw, and maybe a miter saw you must ensure that they fit in the drawers provided without exceeding their weight capacity. Another consideration is how you will store your hardware. 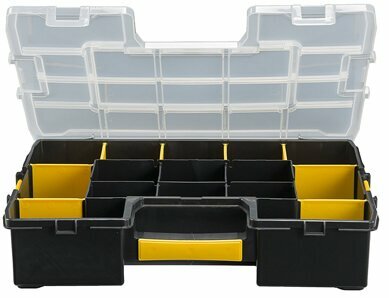 Ensure you will go for a model that has several compartments where you can store your tools conveniently. 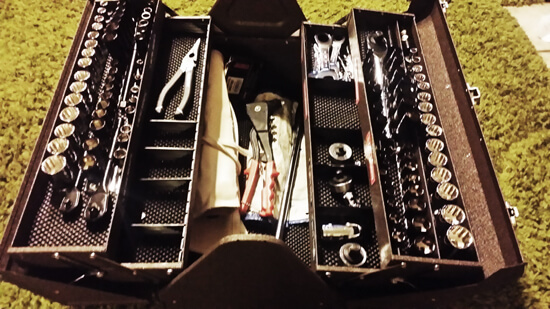 The best model should have larger compartments where you can store the larger tools and smaller compartments to store smaller tools such as the screwdrivers and another kind of hardware such as screws, nuts, nails, bolts and washers. As previously mentioned, tool cabinets come in variety sizes, shapes and make. The prices of these models also vary, and you may find high-end tool cabinets costing up to thousands of dollars. However, if you are looking for something small and portable you can find a model that costs you less than fifty bucks. However, you should keep in mind whether you would want to extend your collection of tools or not. However, investing in a larger model is a smart choice especially if you are planning to add more. Owning the best tool cabinet is necessary especially if you have many tools and you are looking for the best way to stay organized. To ensure that you get only the best model, ensure that you consider the points listed above for you to select a model that will suit your needs perfectly. Additionally, you can browse through our website to find out our recommended tool cabinets so that you can narrow down your choice to the model that fits your requirements. Goodluck! Having a nice set of tools is a great thing for DIY fanatics, but that is never enough if you don’t store them properly. How often do you find yourself looking for that misplaced tool just because you don’t remember where you kept it? It can be frustrating and a waste of time. Storing your tools properly has several benefits making the tool bag an important item in the home. 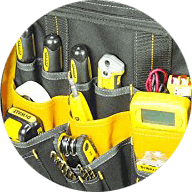 Tools that have been properly stored in a tool bag are usually easy to find and rarely get lost. I remember losing my bonsai cutters and only found them a week later badly damaged by water. They had rusted and would not work anymore simply because I had forgotten to store them properly. A good storage bag wold have helped me store them properly. However, you have to know how to choose the best tool bag if you are to store your tools properly and get good value for money. 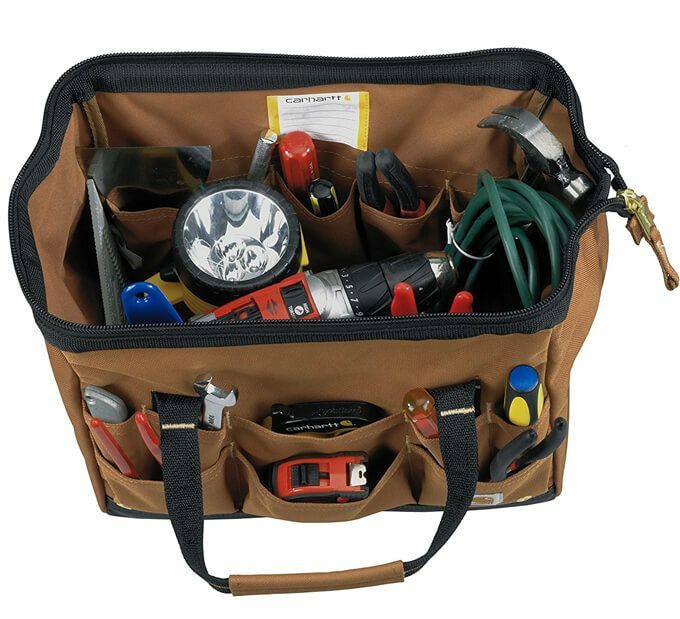 It is crucial that you take time and choose the ideal tool bag that fits all your tools and stores them protected from water. You don’t want to buy a tool bag that will be too heavy to carry. 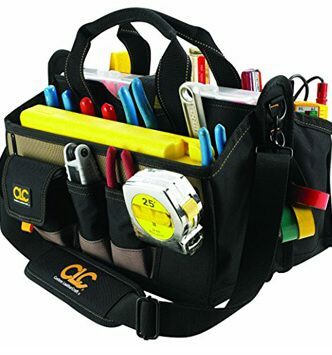 Having a reliable, safe and nice tool bag to store your tools is very important. It will give you peace of mind because you know that all your tools are safe without having to worry about misplacing any piece. 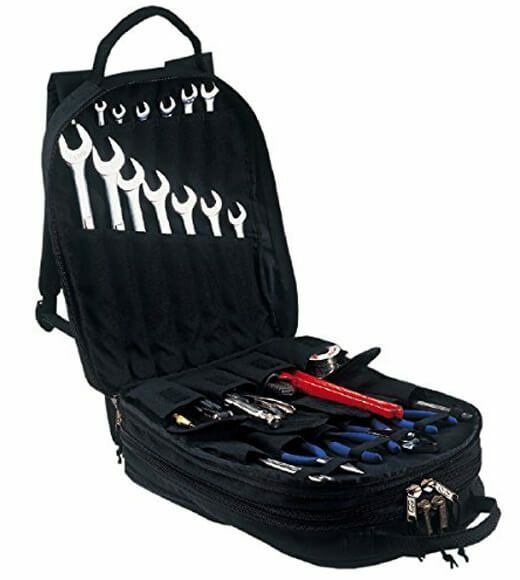 Additionally, the tool bag will allow you to transport all your tools conveniently. 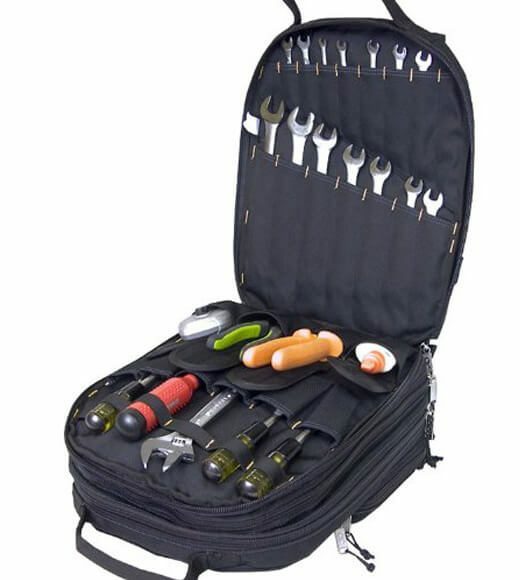 At sawreviewed.com, we are committed to ensuring that you get the best tools as well as carrying bags that make it easier for you to transport the tools from home to work. Here are our Best tool bag reviews. There are several tool bag brands in the market. Most of those brands manufacture tool bag that is available in the market. We discuss each product by brand. Loading and unloading tools from this bag is easy. This is because it has a large mouth opening that accommodates different sized tools even the large one easily. 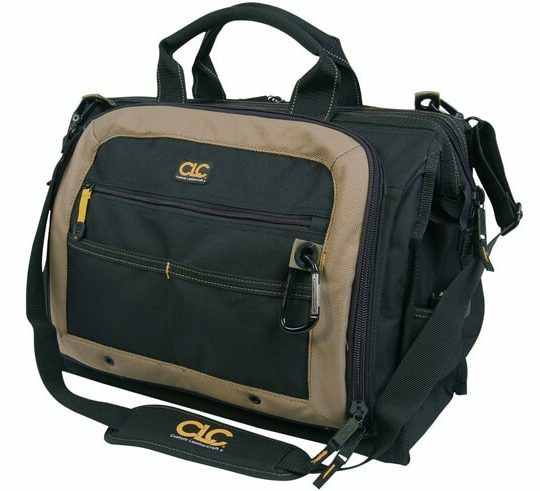 Customers who have already used the bag are very happy when it comes to it durability and ease of use. To ensure that it last for long time, the manufacturer has used tough fabric and reinforced the frame with tough materials. For added comfort, the bag comes with removable padded shoulder straps as well as side pull handles. The likable feature of this top tool bag is the relatively huge measurements. 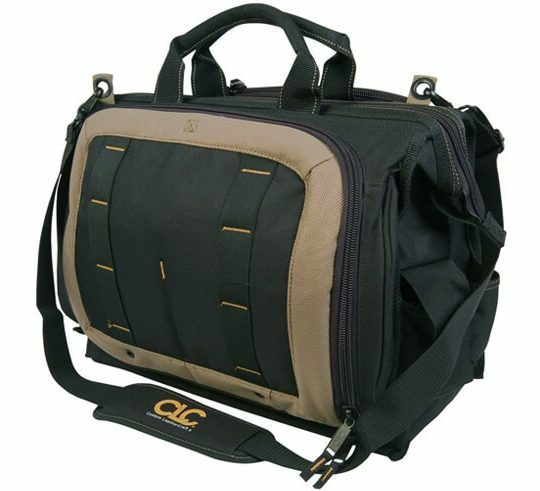 This bag is super comfortable and will help you to hold most of the tools you use on a daily base. 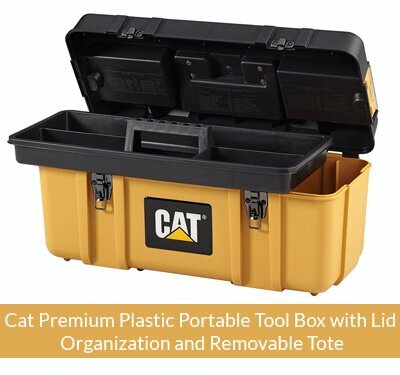 The bag features heavy-duty construction to ensure it gives your tools the much-needed protection while still making it durable. 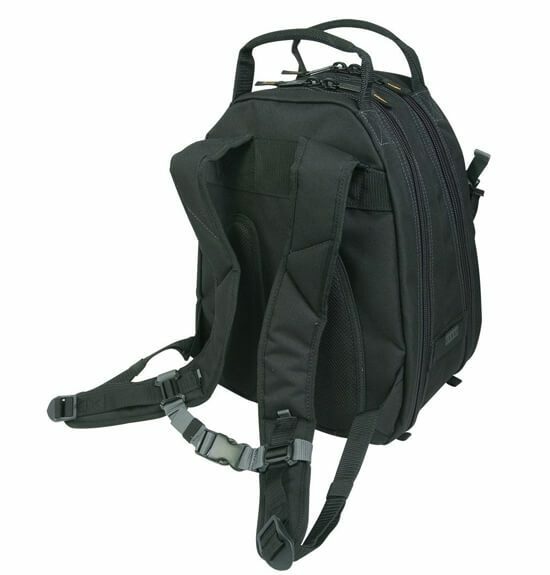 The ergonomic design as well as the well side straps makes it very comfortable to carry along. 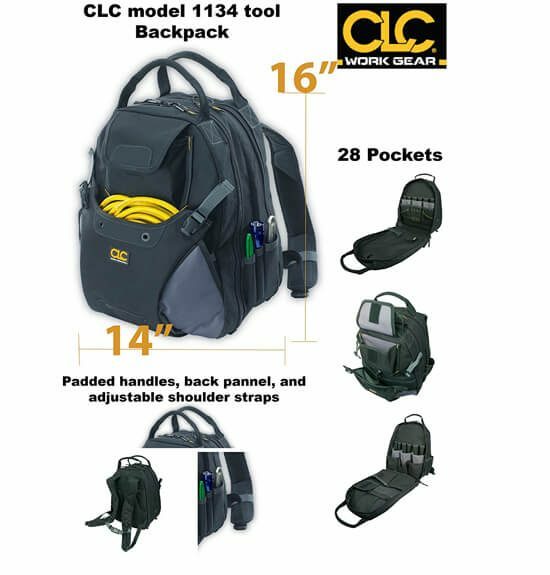 Another impressive feature that comes with this model is the 30 exterior pockets that allow you to arrange your tools easily for quick accessibility. 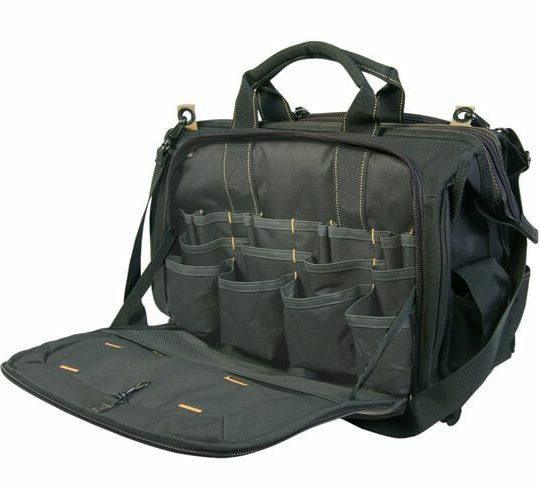 Unlike other tool bags on the market, this bag comes with impressive features at a reasonable price. First, this bag is constructed with the toughest materials, which are not only durable but also water resistant. This makes it great for carrying under all weather. 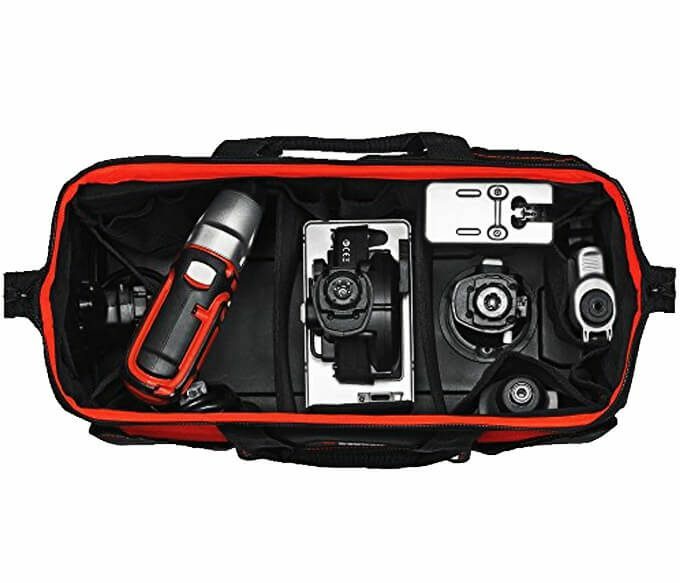 The bag also features a super wide opening that allows you to store your equipment easily and for quick access. For convenience, the bag comes with 36 pockets where 26 of them are on the exterior while the rest are on the inside. 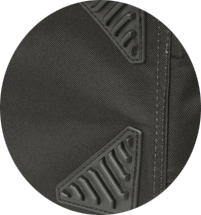 Other great features include the well padded and ripstop pocket as well as an iPad zipper pocket. The bottom of this bag is reinforced to help protect the contents in case the bag falls accidentally. 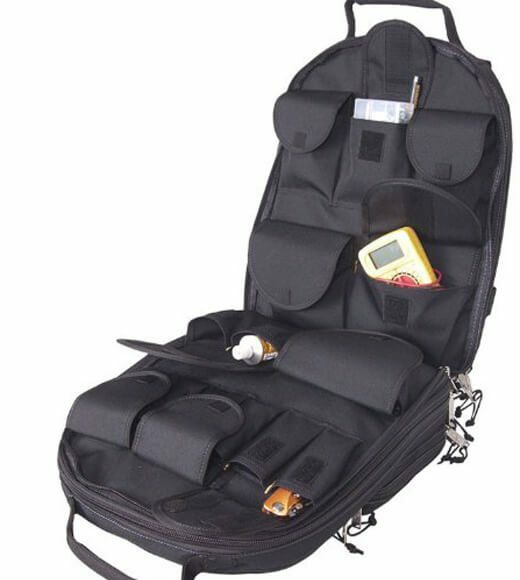 The bag will offer you with enough space to store all your work tools especially if you are a contractor who is always on the go. The construction materials are tough so you do not have to worry about the bag tearing even if you carry sharp tools. The bag itself is very light meaning that it will not add on the language you are carrying. Additionally the bag comes with nice straps making it easy to carry. 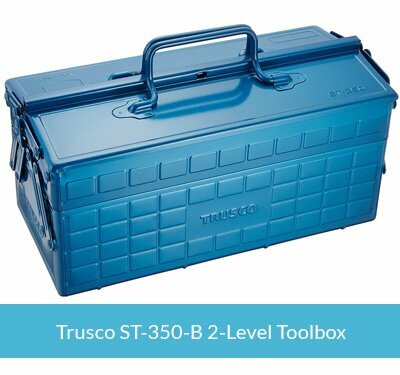 For those who carry many tools to their workplace or need a bag where you can arrange all your tools for safe storage, this is a great choice. 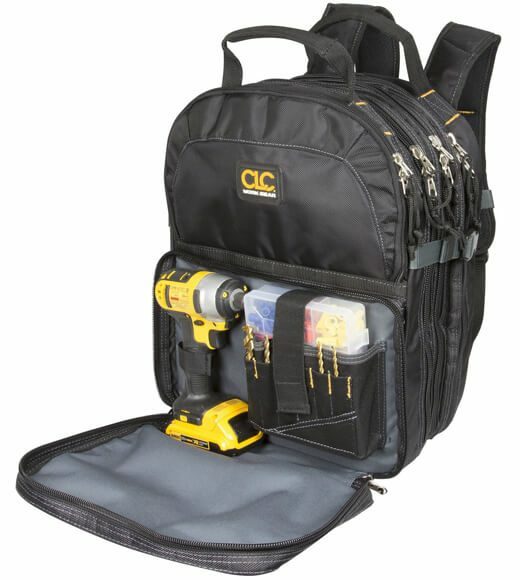 Unlike other bags on the market, this bag comes with a compartment that has web loop to help accommodate tools with large handles. You are also provided with a multi-compartment plastic tray for ease of access. 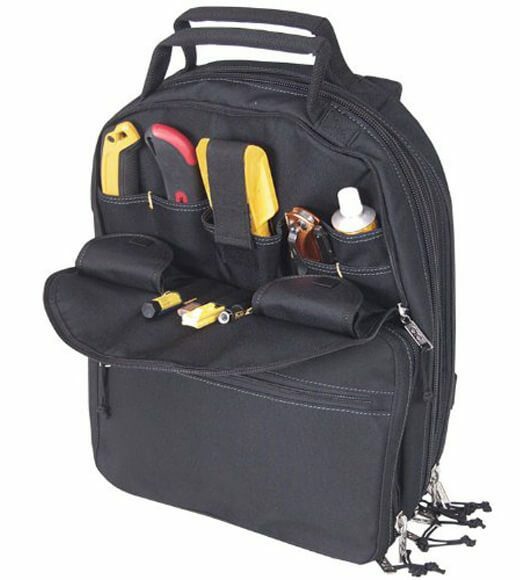 Additionally, this bag comes with eight pockets both on the outside and inside that helps you to arrange a wide a variety of tools and accessories. 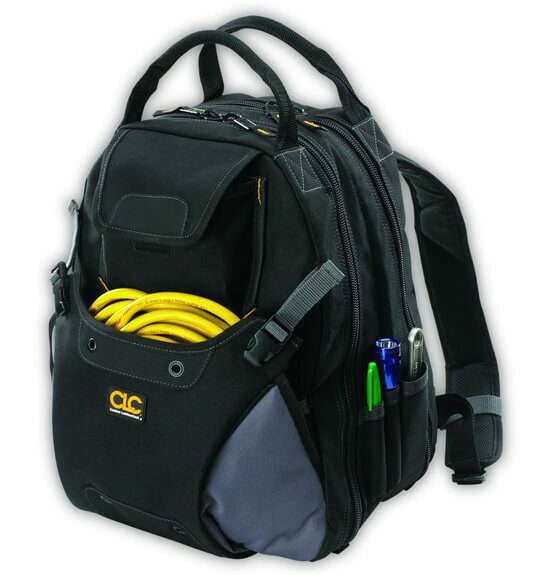 There are many advantages of opting for a backpack tool bag. 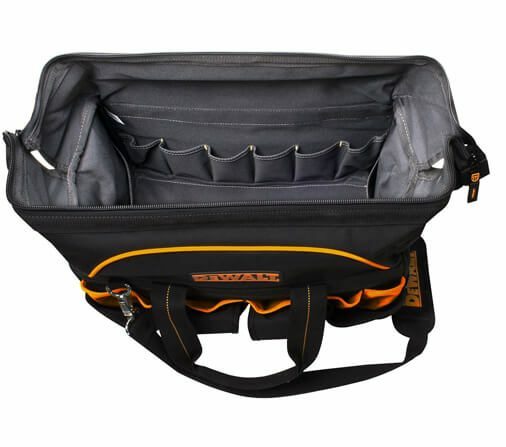 This bag is not only convenient to carry but also help you to carry heavy tools comfortably as the weight is equally distributed on your back. 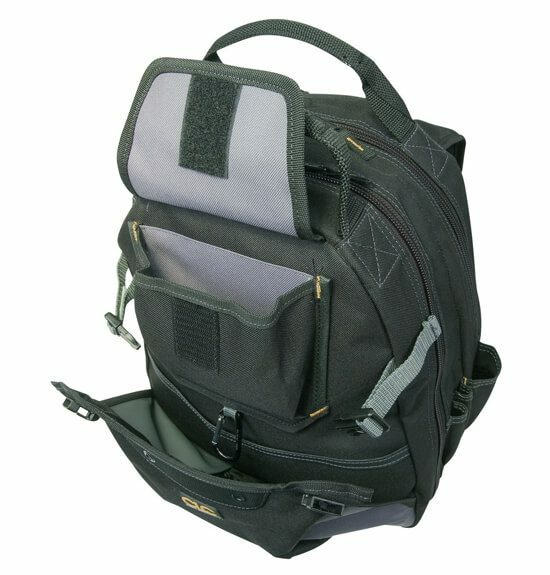 This backpack features impressive features such as adjustable compression pockets for bulky items as well as a well padded back support as well as shoulder straps that allows you to carry heavier tools easily. 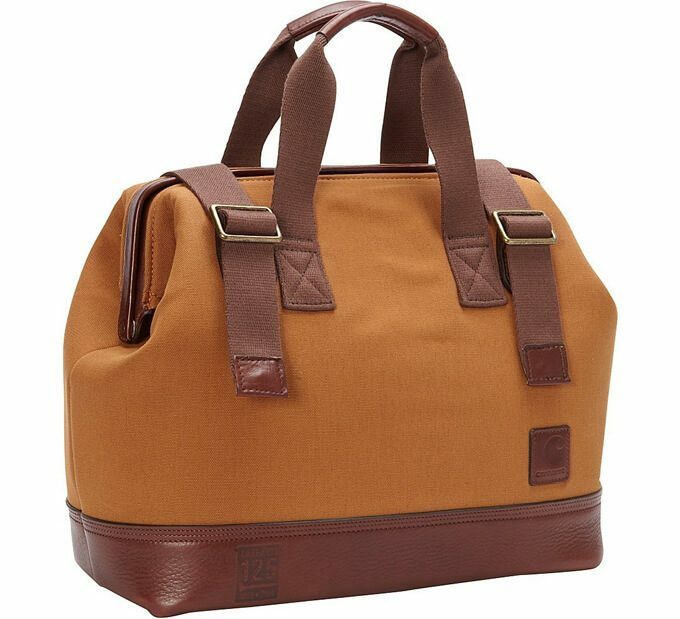 This bag features 41 pockets in the inside and 7 pockets on the exterior. 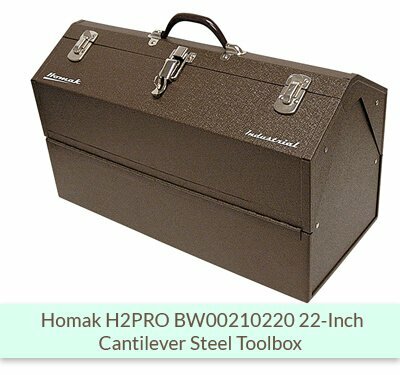 This is one of the most sophisticated tool carriers that allow you to carry multiple tools easily. With 54 pockets on the inside and 4 exterior pockets, you can organize all the tools you have for ease of transportation. 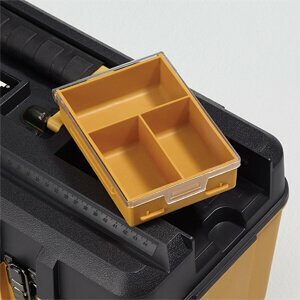 The main compartment is divided into two where you have the large compartment for carrying large tools and another compartment with small pockets for storing single tools. This makes it very easy to access the tools. Additionally the bag is constructed with high quality materials that withstand repeated use. 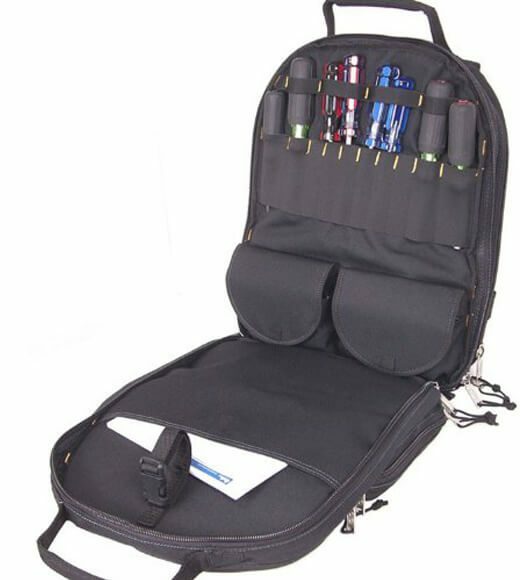 This is another top tool bag that comes in backpack design. 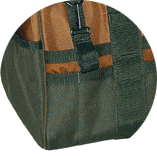 The bag features 75 pockets for storing small tools. For durability, this bag is constructed using ballistic poly fabric that resist tear from the sharp pockets. With this bag, you do not have to toss the equipment on top of each other. The 75 pockets allow you to keep each tool on its own pocket for ease of accessibility. The bag comes with a well-padded back as well as shoulder straps making it easy to carry. 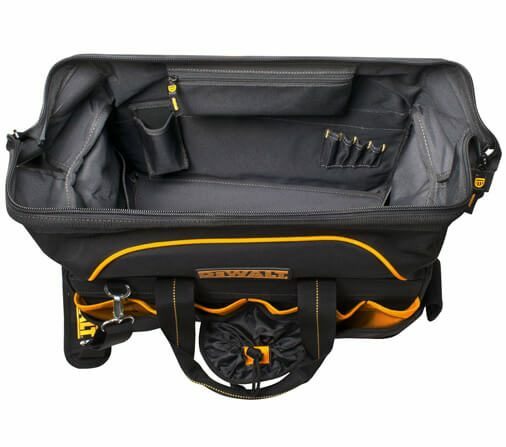 DEWALT DGL523 Lighted Tool Backpack Bag is designed to suits the needs of people who like working with only small tools. This bag is made using durable materials that is tough enough to bear heavy weight easily. 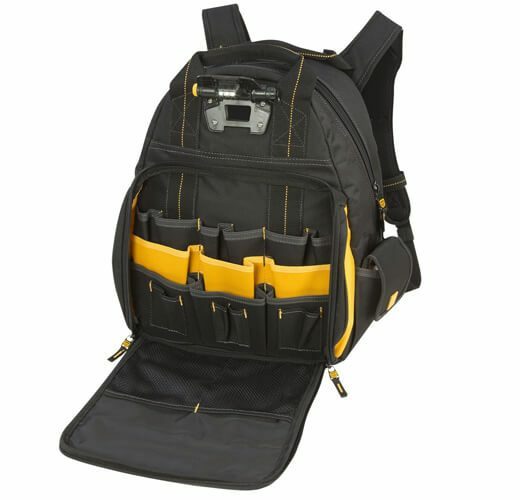 Be backpack come with impressive features such as the LED lights that makes it easy to locate the tools in darkness or you can direct to a working surface for more visibility. 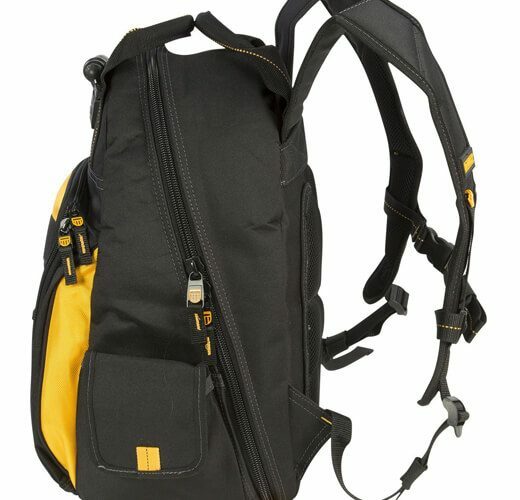 This bag holds a maximum of 48 tools and come with well-padded back and shoulder straps that make it easy to travel with. DeWalt 18 in. 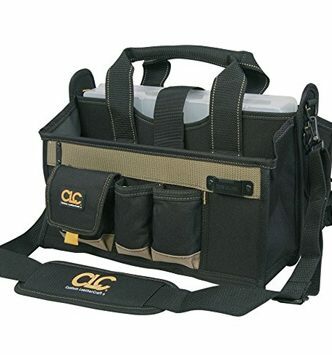 Pro Contractor’s Closed Top Tool Bag is a low cost option tool bag that comes with a decent quality. It is great for professionally duty jobs and DIY enthusiasts. This bag offers you with roomy storage than most of the bags available on the market. It is great gift for your husband or partner especially if they are love working on construction projects. 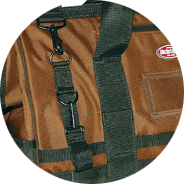 Some of the impressive features that come with this bag include utility knife pocket, non-slip padded shoulder strap and a measuring tape clip. 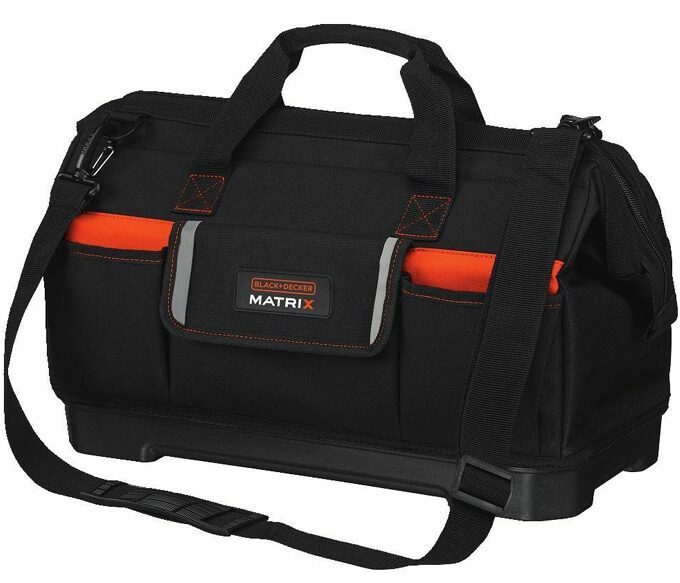 If you own Makita tools, why don’t you protect them with a customized bag from the same manufacturer? 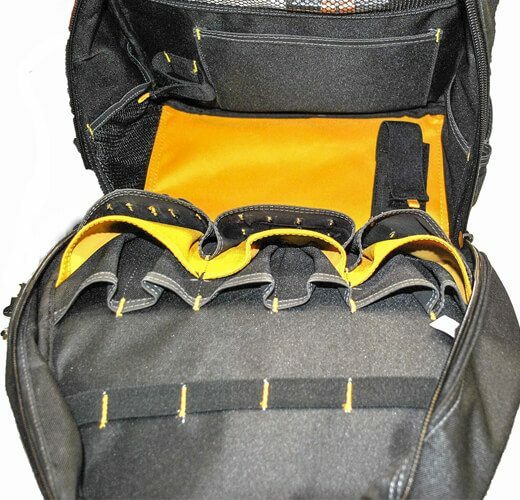 This bag is constructed using high quality industrial fabric making it ideal to use on any jobsite. 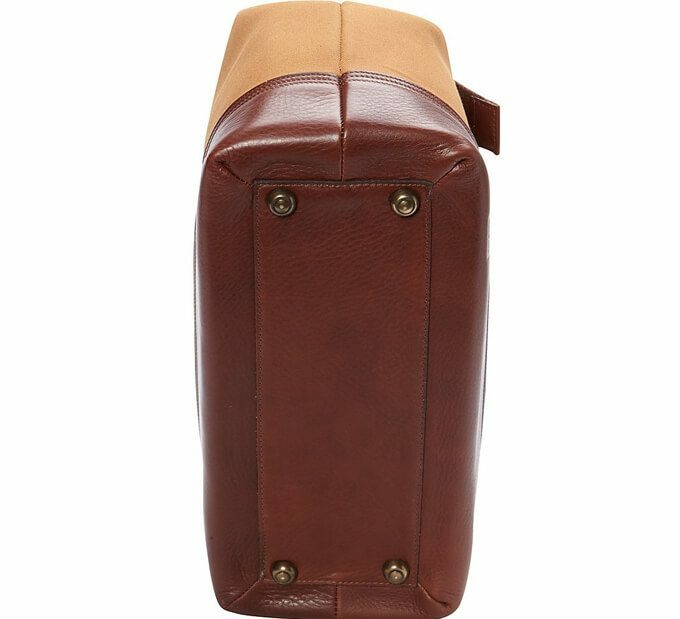 The main compartment has a high quality sipper for enhanced durability and ease of work. 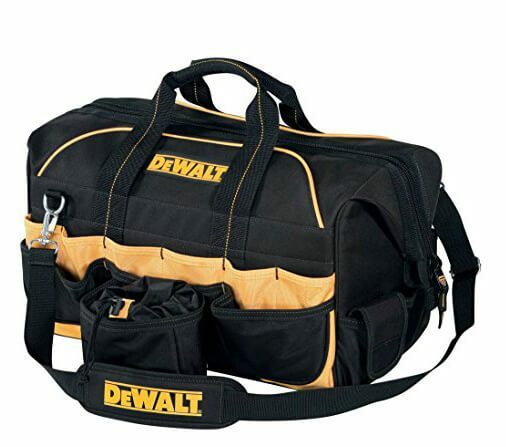 Additionally this bag comes with reinforced handles that allows you to carry heavy tools as well as shoulder straps for added convenience. 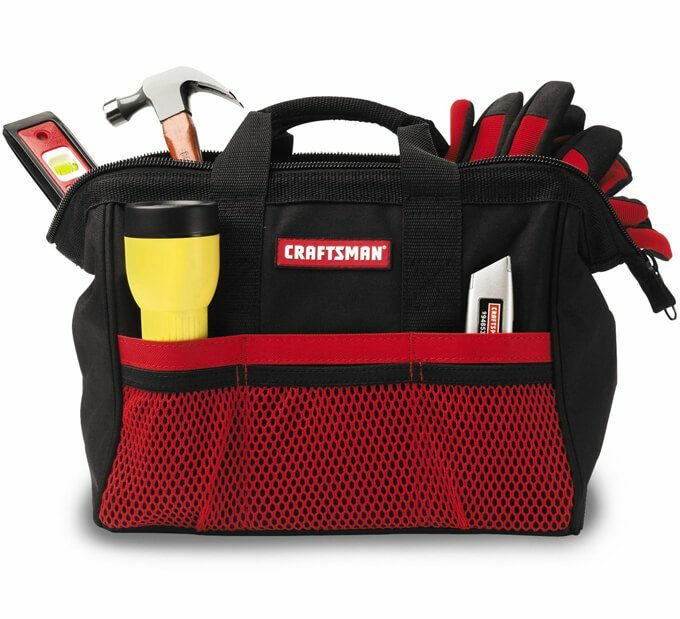 This high-end tool bag comes with all the features that you need to keep your tools secure. 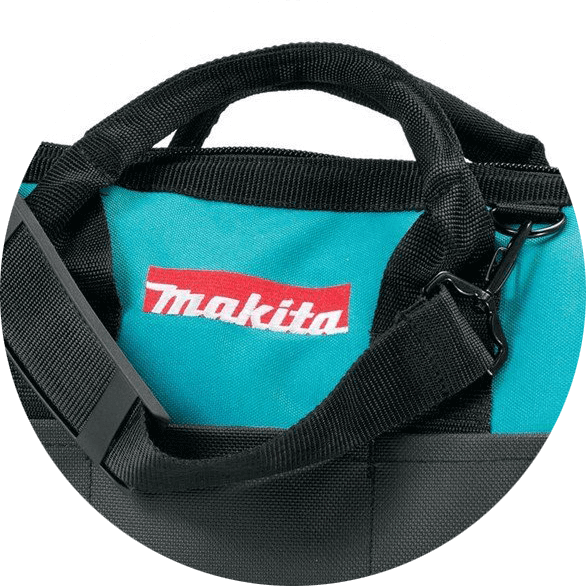 Makita P-79946 Open Tote Bag is constructed with high quality fabric and materials to make it usable in any construction field. The fabric will resist abrasion and tear ensuring that all your equipment is protected. 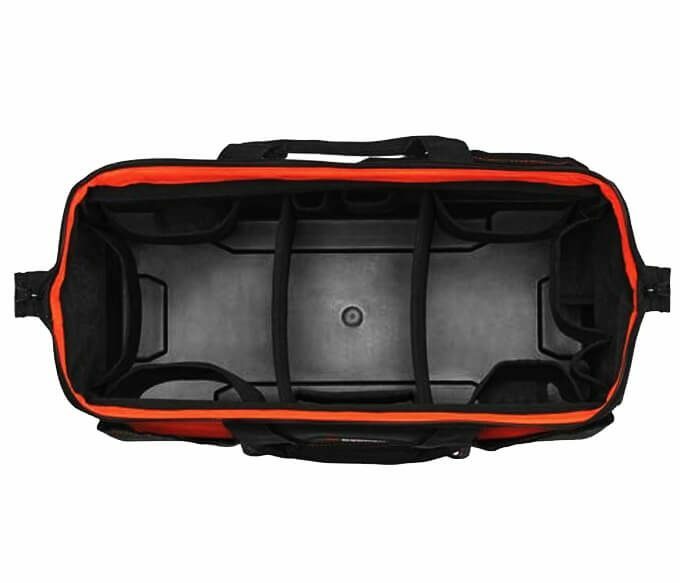 The large main compartment is fitted with many pockets that allow you to store various tools easily. 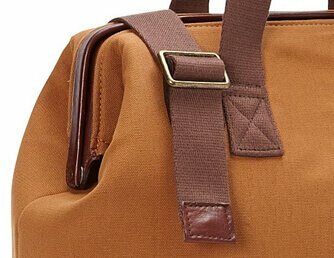 You will also love the well-padded handle that makes it easy to transport. Multiple pockets and holders for tools. Dedicated handsaw pocket with zipper and securing strap. Heavy-duty steel handle with ergonomic foam grip. 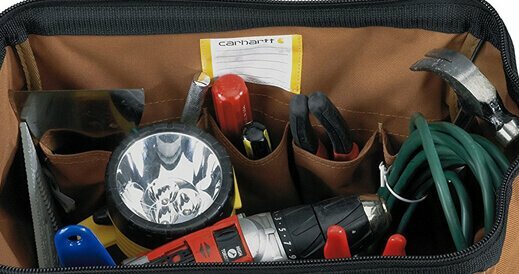 The Carhartt Legacy Tool Bag comes with many pockets, wide mouth and it is designed to offer quality service for long. 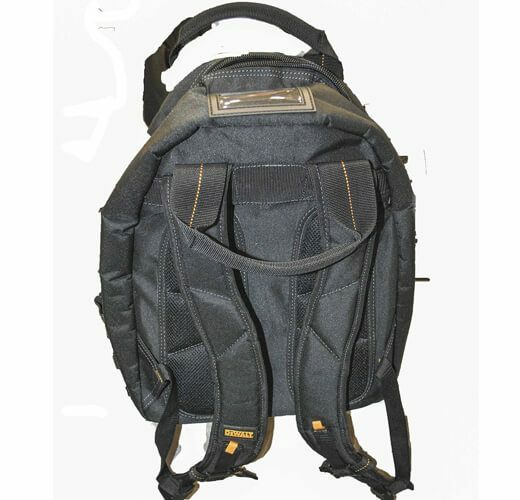 This bag is constructed using high quality 1200D polyester fabric making it not only durable but also very secure. The main compartment is zippered by a durable commercial grade zip for enhanced security. 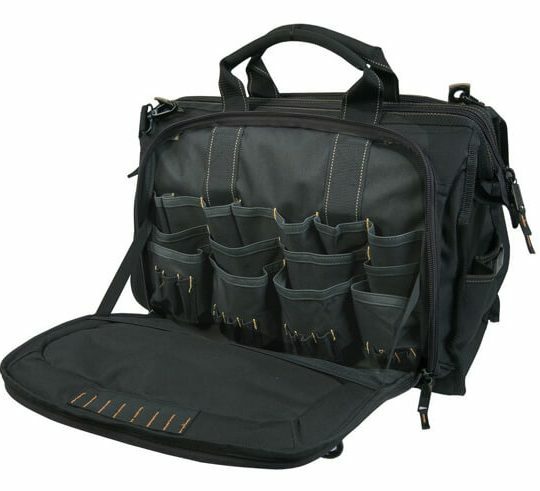 There are also 17 exterior pockets and 10 interior pockets that allow you to arrange your tools conveniently. 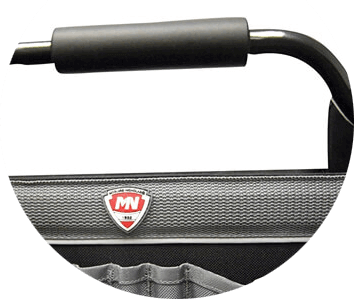 Additionally the internal metal frame allows you to access all the equipments easily while still preventing the bag from collapsing on it. 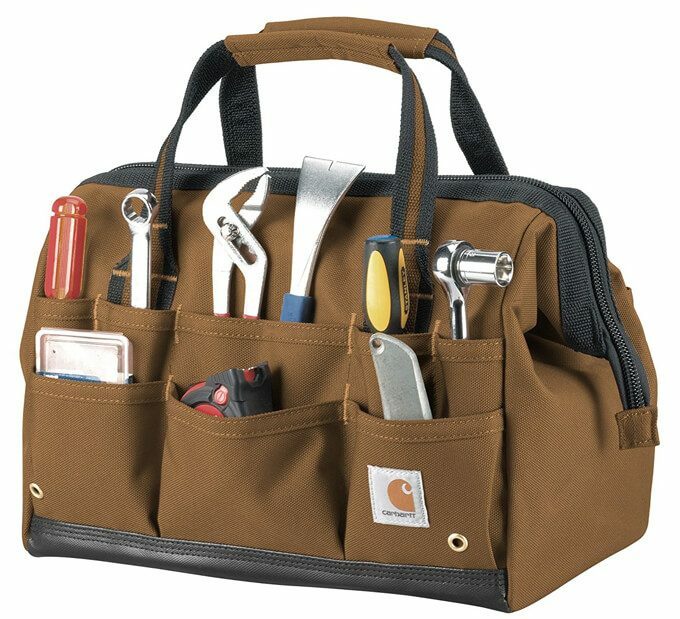 This is another high quality tool bag from Carhartt. This bag is a heavy-duty cotton canvas bag that comes with a reinforced bottom and top. The bag also features a metal frame in the inside that makes it easy to access, as it will never collapse on itself. Additionally the bag comes with very comfortable grip haul handles as well as plus rugged cotton webbing strap closure to ensure that all the tools are secure. 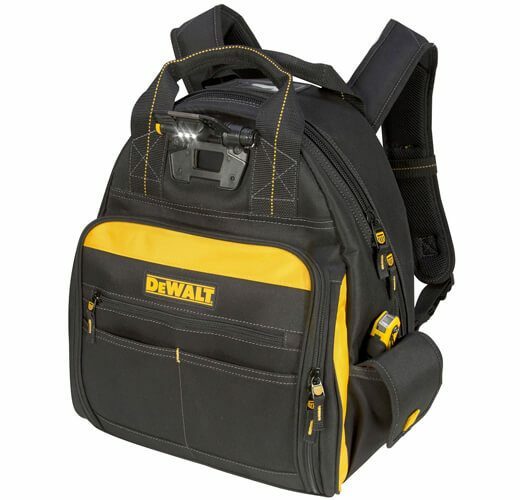 This bag is great for DYIers and professional contractors alike. 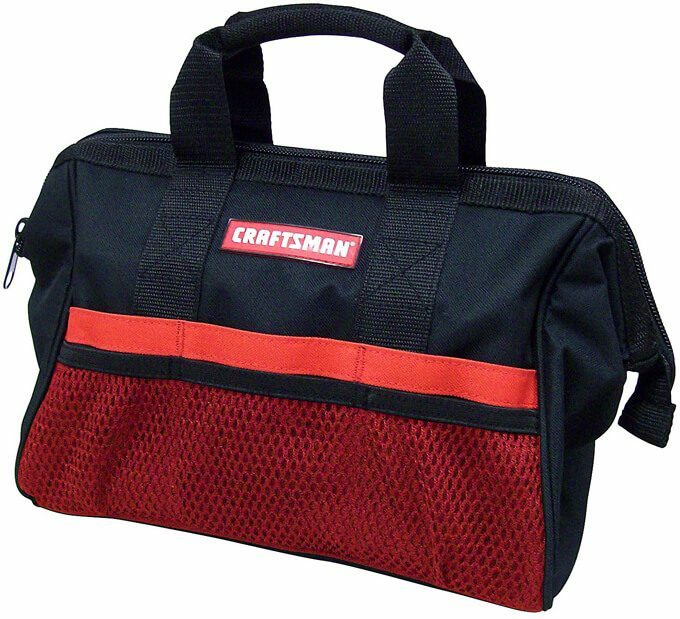 ​Craftsman 9-37535 Soft Tool Box, 13"
This model comes with a deep main compartment that features a pop open design that is great for holding full sized power tools. This bag also comes with plenty of many other small pockets that will help you to organize all the tools for quick accessibility. The ergonomic design plus the comfortable side handles also makes the bag very easy to carry even if you are carrying heavy equipment. In addition, this bag comes with three mesh and three regular exterior pockets that allows you to store your tools conveniently. If you are looking for something convenient to assist you in your daily needs, then this is a good choice. 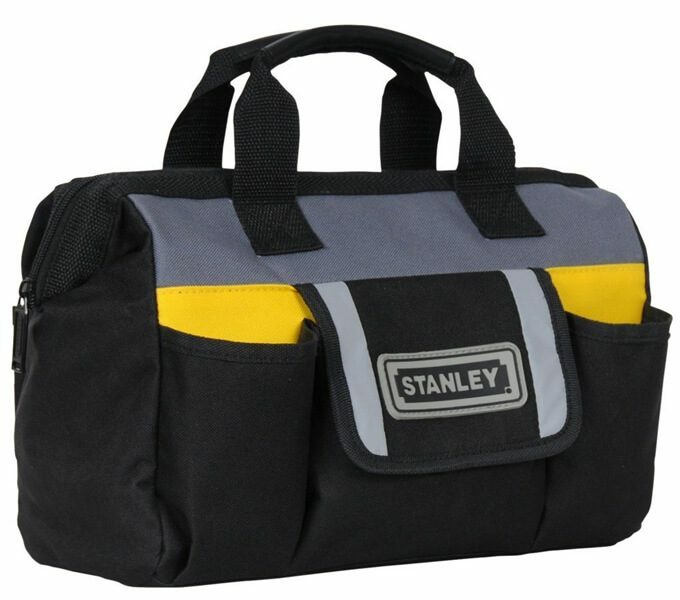 This top tool bag is reasonably priced and caters for the needs for contractors who are always on the move. 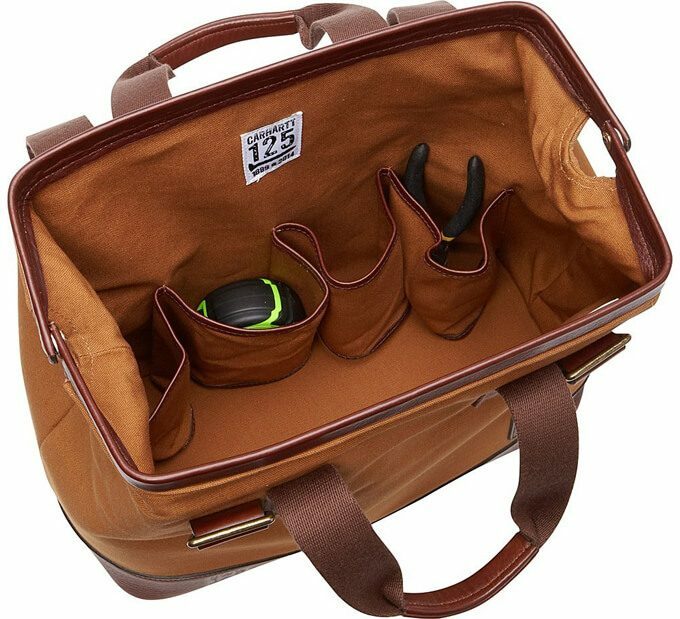 The bag comes with relatively large compartments where you can store all your tools when transporting them to the place of work. The bag also offers you with many external pockets that you can store your tools to keep them ready when you start the task. 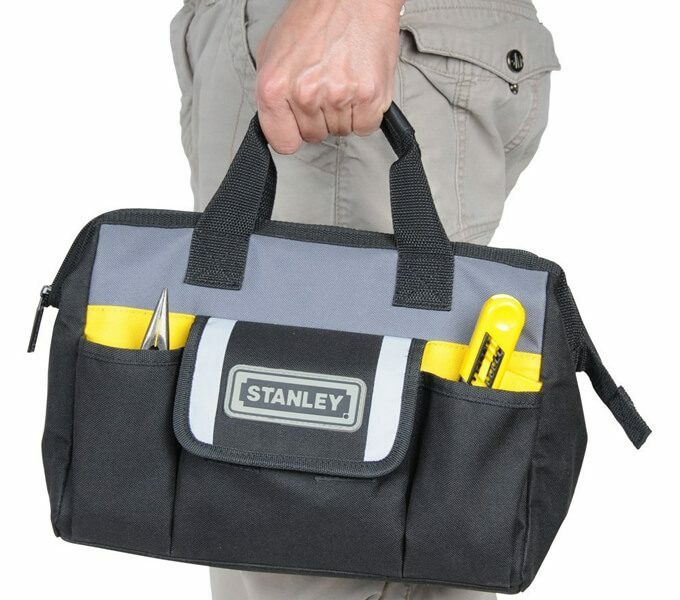 This high quality professional tool bag is roomy enough to hold all your tools. 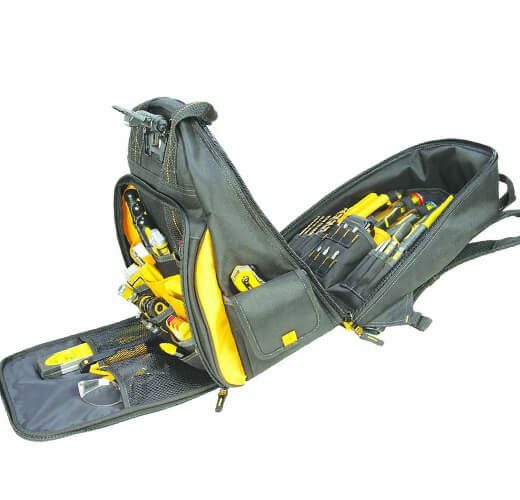 The bag also has many compartments to take care of small and medium sized tools. This allows you to arrange your tools neatly meaning that you will take less time to access them. The bag is also constructed with heavy-duty materials so that it can endure repeated use easily. 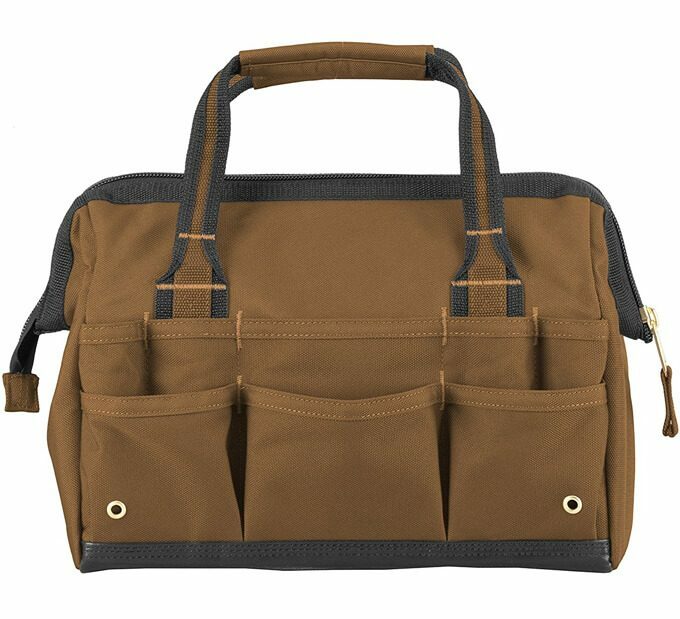 McGuire-Nicholas 22015 15-Inch Collapsible Tote is constructed with all weather fabric, making it perfect got using under any weather. The tampered pocket design allows for more storage space, making it ideal for individuals who have many tools to store. Additionally this model is perfect for on the go contractors as it come with a tabular steel handle with is paddle with soft cushion. This ensures that it feels comfortable even when carrying heavy tools. 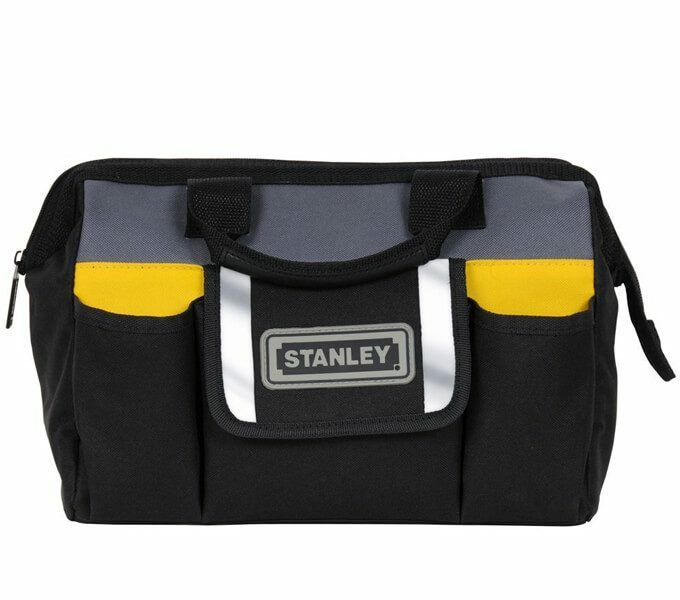 Stanley STST70574 is another top tool bag and this we attribute to its sturdy construction that allows you to carry every tool you need to the jobsite easily. 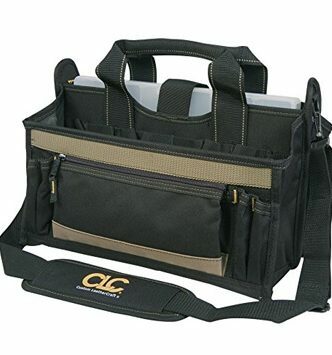 This bag is ideal for carrying hand tools as well as other small construction tools. 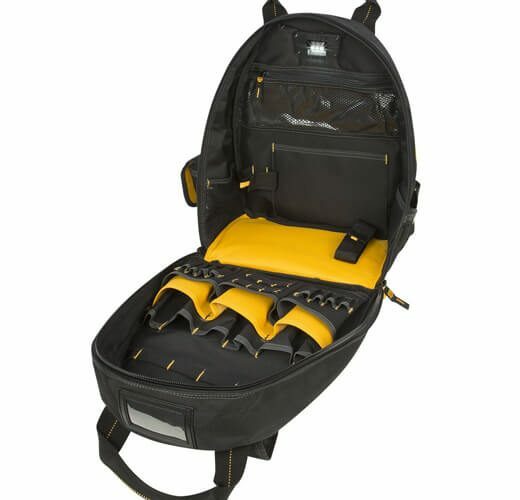 Its roomy compartment will allow you to store many tools while it is comfortable and cotton padded handles allows you to carry the bag comfortably. Additionally the rubber foam bottom keeps the bag sturdy while protecting the contents from hard falls. There is a lot of consideration every buyer should take into account before committing to order any tool bag. Choosing the best tool bag will prove to be a great decision once you start using it. Tool bags are heavier because of the tools they carry in them. You have to choose a bag with an ergonomic design that is easy to carry. The design of the bag should make it easier for you to carry with a good handle and padded straps for comfort. The tool bag should be sturdy and strong and not one that will break under pressure. Some of the strong bags are made from poly fabric, nylon, and canvas. 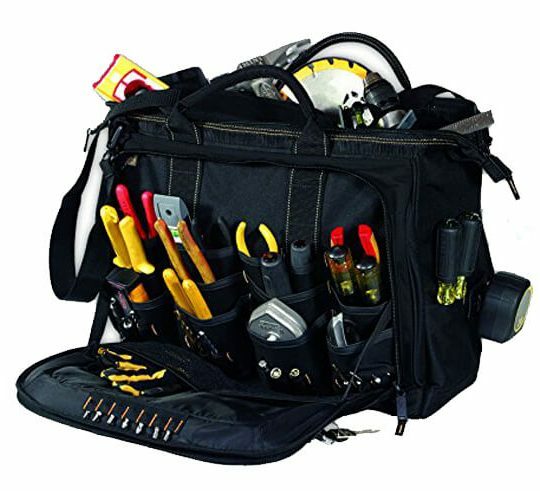 In choosing the best tool bag, you must go with one made from sturdy and durable materials that will last for years. A stronger and sturdy bag will also be able to withstand the weight of the tools. 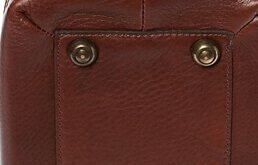 The patented center panel is another crucial feature that prevents the bag from losing its shape when under pressure from heavy tools. 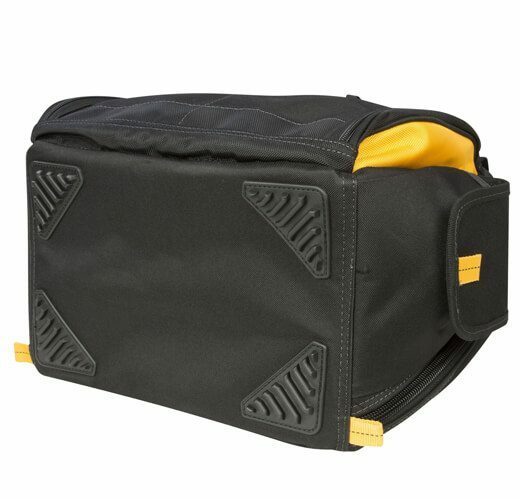 The panel extends the bottom of the bag allowing for easy access when storing and taking out your tools. The center panels also help distribute the weight of the tools making you carry the bag without straining one part of the body. 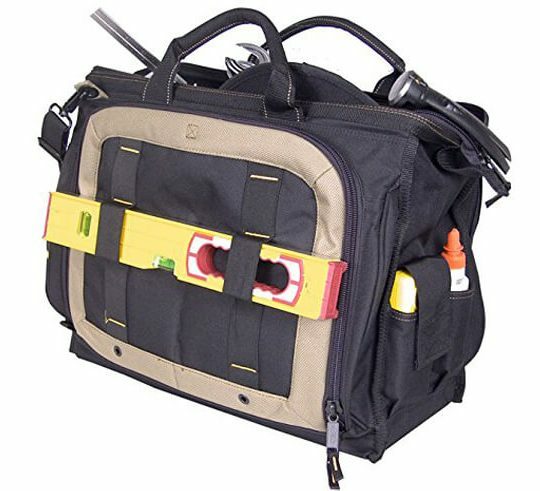 The tool bag must have the vertically tiered pockets that are usually attached to the center panel. This allows the user to immediately see and access the tools he/she needs with ease. All your handy tools are stored within reach where they can be seen with ease. The tool bag must be held together by marine grade rivets and snaps that don’t break under pressure. The marine snaps and rivets are high-quality fasteners that hold your bag safely when carrying the heaviest tools. You can be assured your bag will not break loose even when carrying the heaviest tools. The base of the bag should be durable and waterproof to prevent soaking of water when placed on the ground. We use tools in different environments and are likely to place the bag on the wet ground. 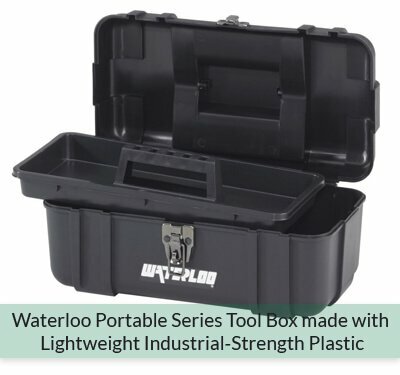 A tool bag that is durable with a waterproof base will not allow water through keeping your tools protected in all conditions. The material used to make the cover of the bag should be waterproof to preventing water soaking in when raining. The tool bag should be waterproof as water leaking to your bag can make tools that are not stainless steel to rust. You don’t want to buy a heavy bag even before you store the tools inside. Tools are what make the bag heavy. You should always look for a bag that is sturdy and strong but lightweight in design. If you like moving with your tools from one place to another, then the tool bag should be one that is easy to carry around. It should be lightweight and with an ergonomic handle that allows one to carry it with ease. This is an important factor to consider as you want your bag to carry as many tools as possible. Consider the number of tools the bag can carry and choose one that is convenient for you. Are the handles textured? 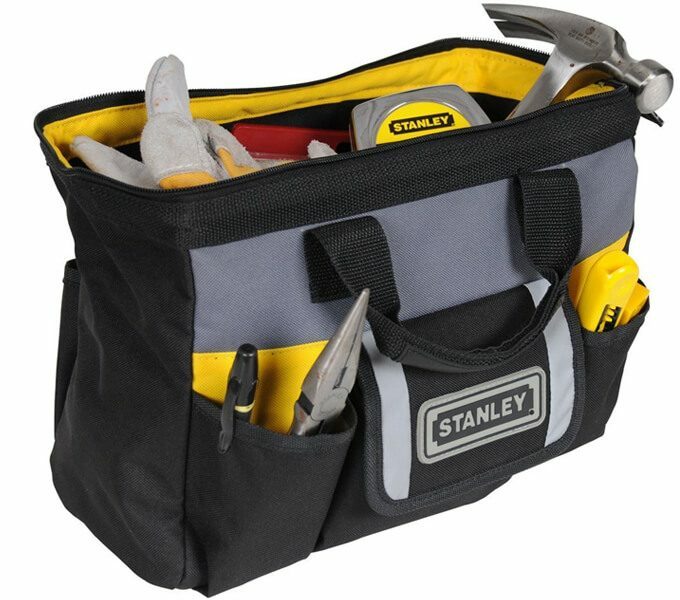 The tool bag should have textured handles that will not slip from your hands even when sweating. The tool bag should have heavy duty fasteners and zippers. The last thing to happen is a zipper breaking off rendering the bag useless. 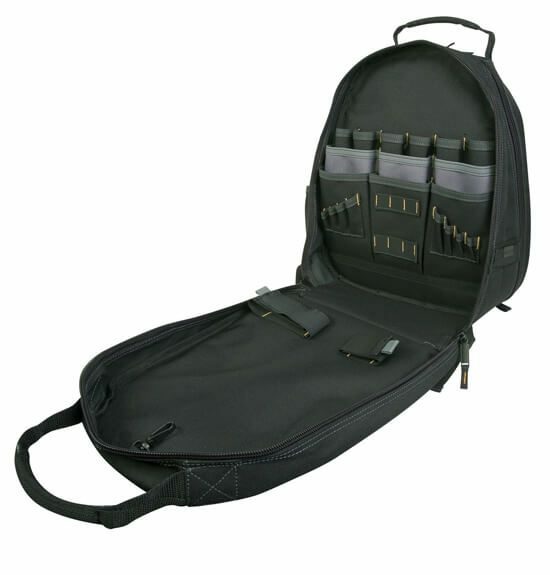 Padded bags with extra wide straps are comfortable to carry than those that lack pads. Choose a tool bag with a thick padding and wide straps. Check to ensure that there are D-rings for attaching tools and that they are of the good quality. The D-rings should be properly attached to the bag. The best tool guide above will enable you to choose a bag tool that best serves you and gives you good value for your money. The high number of bag tools in the market can make it quite challenging choosing the right bag tool, but with the guide, you have everything you need. The considerations help you choose a bag tool that is durable, strong, portable and one with enough storage capacity. We have come up with the list of the Best tool bag reviews by going testing the most popular product on the market. We have gone to great depth by looking at the reviews and customer satisfaction rate to ensure that you get exactly what you pay for. 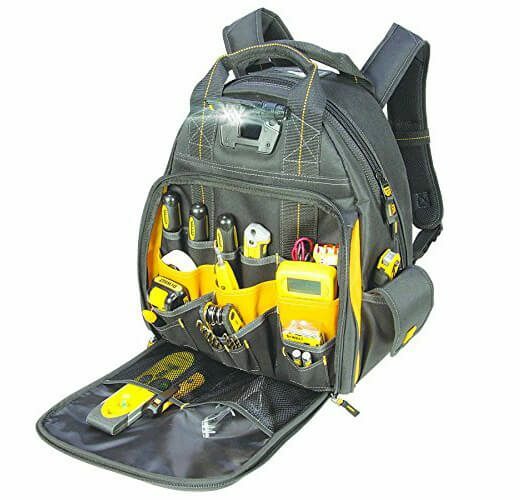 Go through each of the product listed, compare the features and select the best tool bag that suits your needs.